Jan. 23, 2013, 3:10 p.m.
After 13 months, The New York Times this week discontinued its elections app rather than turn it into a general politics app. Here’s what they learned along the way. By Adrienne LaFrance @adriennelaf Jan. 23, 2013, 3:10 p.m. The election is over. Even the inauguration is over. So it makes sense, perhaps, that The New York Times this week discontinued its Elections 2012 mobile app. As we wrote at launch, the Elections 2012 app was one of the Times’ most vigorous forays into aggregation — including prominent links to other news orgs’ stories on the same subjects the Times was writing about. 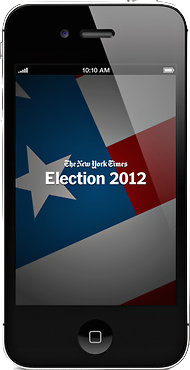 The New York Times 2012 Election app was built primarily with HTML5; it’s since debuted an all-HTML5 web app to complement its native mobile apps. The Times decided that a dedicated elections app was worth the time and resources — but that can be a tough calculation to make. For now, the Times is applying its experience with the elections app to its main news app. That includes testing new kinds of storytelling that debuted first in the app, like clustering tweets and articles around a given topic. And Spruill’s team wants to focus squarely on 2013 before dreaming up a mobile strategy for the midterm elections or beyond. POSTED Jan. 23, 2013, 3:10 p.m.
LaFrance, Adrienne. "Lessons from The New York Times’ app graveyard: When an app has an expiration date." Nieman Journalism Lab. Nieman Foundation for Journalism at Harvard, 23 Jan. 2013. Web. 23 Apr. 2019. LaFrance, Adrienne. "Lessons from The New York Times’ app graveyard: When an app has an expiration date." Nieman Journalism Lab. Last modified January 23, 2013. Accessed April 23, 2019. https://www.niemanlab.org/2013/01/lessons-from-the-new-york-times-app-graveyard-when-an-app-has-an-expiration-date/.